It’s a with great pride that Joel Radio can introduce you to Seiko, a native Japanese man who now lives in America and who is one of Joel’s former comedy students. Seiko is funny and charming and he has found success reviewing Japanese restaurants in the U.S. and sharing them on Facebook. 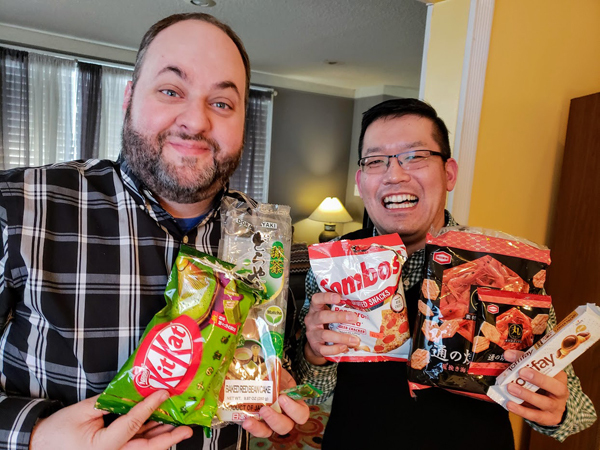 This caught the attention of Corey Hall who asked Seiko to bring back some snacks from a recent visit to Japan. Those snacks, which the guys try, include green chocolate Kit Kats, pickled seaweed, and shrimp flavored cookies. They’re as good as they sound, folks! Corey retorts with wacky American snacks, some of which were new to Seiko! Will he enjoy a Toffifay? Listen to find out. The guys also chat about Seiko’s comedy career, how he’d fare in a black comedy club and much more. Also, which Fyre Festival documentary should you watch to see “influencers” get scammed and made to suffer? Joel and Corey have seen both and they’ll get you up to speed. Plus, what’s so special about Japanese toilets?, Mary Poppins Returns is the same crap, Roma feels like film school (in a bad way), and a Ruth Bader Ginsburg double feature is what has become Joel’s life in Oscar season.